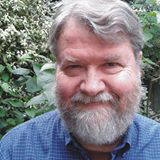 Dr. Scott A. Elias is Professor of Quaternary Science in the Department of Geography of Royal Holloway, University of London, specializing in environmental biology. His chief research focus concerns the reconstruction of past environmental change and the response of animals and plants to those changes during the last million years. Shale gas is methane trapped in tiny pockets in shale rock formations. In order to extract the gas, engineers drill shafts down into the shale, most often with many radiating horizontal shafts that feed into the vertical shaft. Engineers drill vertical shafts down to great depths, then they drill radiating horizontal shafts that feed it. Then they force hydraulic fluids into the rock to fracture the shale and open the pockets of gas, releasing it to flow to the surface. The term "fracking" is short for "hydraulic fracturing." Over the past 10 to 15 years, the number of fracking wells has expanded rapidly in the US, liberating increasing amounts of methane. 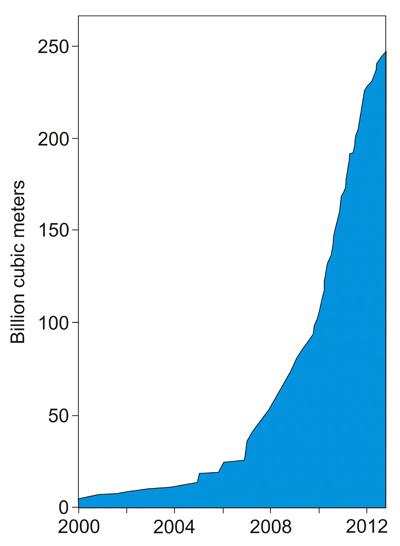 So much natural gas has been extracted through fracking in recent years that US carbon emissions are actually falling. This is partly due to the economic recession since 2008, but the US Energy Information Administration reckons that just less than half of the fall in emissions is due to the replacement of coal burning with shale gas for electrical energy production. It would seem that shale gas, which occurs in shale deposits around the world, is in a perfect position to replace coal in power stations. Already more than a third of natural gas burned in the US is coming from fracking wells, and shale gas is now cheaper than coal in the US.President Obama recently praised the US natural gas boom in a speech on climate change, crediting it with delivering cleaner energy. Many have described fracking as the bridge between the carbon-based energy systems of the past and a cleaner, greener future. If fracking was just a new-fangled way of tapping natural gas sources, it would be welcomed by most people as a cheaper, cleaner alternative to oil and coal. The problems lie in the method of extraction.In order to get the gas out, a witch's brew of toxic chemicals has to be pumped into the shale at high pressure. More specifically, this is a mixture of water, sand, lubricants, poisons to keep bacteria and other microorganisms from clogging the pipes, and hydrochloric acid to dissolve the excess cement in the pipes (Brooks, 2013). If these fluids stayed far underground, they might not damage the human environment. The problem is that they find their way back to the surface through accidents at well heads, well blowouts, backflow of fluids to the surface, and leaks throughout the system. Altogether, more than 650 products containing chemicals with potential cancer-causing properties have been used in fracking (Balaba and Smart, 2012). One would think that a country such as the US would have laws to protect the environment from toxic pollutants like these, but unfortunately the current laws are full of loopholes when it comes to fracking. For instance, an exception to the Safe Drinking Water Act is made for toxic chemicals injected into wells during hydraulic fracturing. An exception to the Clean Water Act permits temporarily stored waste water from fracking facilities to go untreated. Other exemptions to US environmental safety regulations mean that fracking well operators are not obliged to report annual releases of toxic chemicals from their wells (Centner, 2013).Finally, the government does not require well operators to disclose the chemical contents of the fluids they use in the fracking process. These are considered trade secrets. It seems ironic that these companies do not have to disclose the contents of their fracking chemicals, when the manufacturers of household cleaning products must disclose every detail of their contents (Lauver, 2012). The Obama administration is proposing a new set of fracking rules, and their initial proposal has received an enormous number of comments from the public (more than 175,000 responses). The new set of rules only cover fracking on public lands, but the administration hopes that these rules will be adopted by individual states for use on private lands as well. The rules set standards of well integrity and management of polluted water that flows back to the surface. Groundwater pollution is another serious concern, but results of an EPA study on that threat are not expected before 2016. 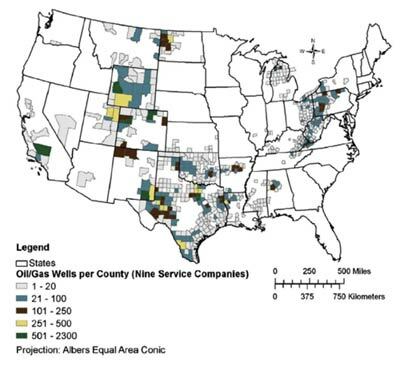 In the meantime, thousands of new fracking wells are springing up all over the country. Balaba, RS, Smart, RB, "Total arsenic and selenium analysis in Marcellus shale, high-salinity water, and hydrofracture flowback wastewater,"
Brooks, M, "Frack on or frack off? 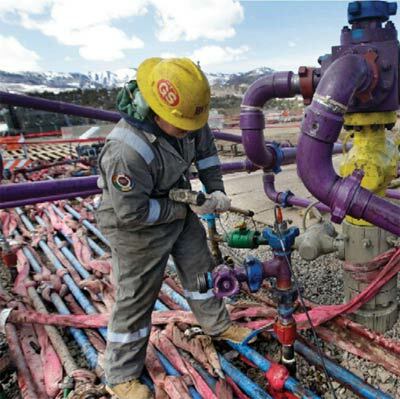 can shale gas really save the planet," New Scientist, August 10, 2013. Centner, TJ, "Oversight of shale gas production in the United States and the disclosure of toxic substances," Resources Policy 38, 2013. Lauver, LS, "Environmental health advocacy: an overview of natural gas drilling in northeast Pennsylvania and implications for pediatric nursing," Journal of Pediatric Nursing 27, 2012. With the case of fracking, after reading about all the risks and benefits, it seems that it is definitely NOT worth the risks. The dollar cannot supersede the preservation of the earth's natural resources...such as water. We all need to educate ourselves before our leaders make all the choices for us. HHMM...serious issues are raised about long term safety and pollution factors that may counterbalance the surge to rush to acquire this monumental wealth and energy based prosperity for many years ahead, especially with the understandable worries about the bad politics of oil and gas producing countries, strangling / blackmailing the rest of the civilised world. . SURELY, with all the technology available now the safety issues should be addressed and overcome as a matter of real urgency....and THEN the rush for a better energy future can go ahead without any worries or hesitation! I think it's a no brainer. Energy is the key to everything. Frack!!! -but let's get better environmental regulation on it. Even with environmental regulation there will still be leaks, backflows, blowouts and accidents. And who knows what it's doing to the structural integrity of the very Earth Crust we rely on. Have you ever considered alternate forms of energy such as Solar, wind or wave power? No brainer is a good adjective as it sums up exactly the mentality of your comment. FRACK NO!!! The clean, green method sounds great, although ruining the ground water for OUR great-grandkids is just plain & simply UNEXCEPTABLE!!! i really bbelieve this helped me because im doing a report and thank you. wow! talk about a one-sided biased article ' a witch’s brew of toxic chemicals &quot; and here i guess i've been wrong all these years to believe that scientist were objective in the assessments. This is the most sensible, rational statement found in a morning of searching a variety of &quot;articles &quot; on fracking. I agree. There seems to be some bias against fracking from the author. Why not just simply research the chemicals in the &quot;witches brew&quot; and include in what proportion they are used with the water?? This could have been a much better article. It was nice that your links help to explain that. to foreign policy. Try getting these countries to slow down their economic juggernaut to appease a few &quot;tree-humpers&quot; in the US!! This is a pragmatic world- which to environmentalists is an &quot;incomvenient truth&quot;. I think fracking and the energy boom in the Dakota's has been a real shot in the arm to US economy as opposed to the &quot;minimum-wage economy&quot; that has been prevalent in this Presidential administration. I say continue to frack. There just needs to be restrictions in relation to lands where ground water sources are present. I live about 2 hours away from a fracking plant up near Williamsport, Pa and I remember going there as a kid to visit my uncle's farm. The amount of fun I would have there was never ending, and reading over this type of stuff disheartens me because I think about him and how hard it must be to continue running his farms even though he knows about the harsh chems in his water supply. I want to know more about this because I want to help find some way to make this a cleaner and more reliable way to get gas. I wouldn't do it for the environmentalist or the local hippies thinking their doing something. No I want to help the people up there because someone needs to. The web site you cited is sponsored by the fracking industry, so not exactly an unbiased source! There are toxic chemicals involved in this process, and one of the main problems is that the drilling companies are unwilling to reveal what they're using. Sponsored? That's seems appropriate language for an activist but a bit harsh it you wish you be considered as an unbiased author...can you please provide citations of just who the &quot;fracking industry&quot; is and exactly how they sponsor this particular website? Wow. Why do people think this is a good idea? Can't they see we are hurting our world beyond repair already? Can't we give up the fossil fuels and ride our bikes or walk places instead? This may seem old fashion but it may be the only way to save our planet from dying in a few hundred years. Think about your children and siblings! GIVE UP THE GAS AND SAVE MOTHER NATURE!!!!! !